The 24th January served us up an incredible day. Living in the Caribbean is lucky for so many reasons, but for us, the best reasons would be the climate and the beauty that we see on a daily basis. Even just taking the school route offers up a glimpse of the beautiful tropical blues along Seven Mile Beach - one almost wishes to be stuck in a traffic jam! But there come days when Grand Cayman just goes a step further and produces a day which is stunning beyond words, and we all get excited about it, and get especially worked up about sharing such a day with our tour guests. It is on these days that Captain Mario's wife and child hound him half to death to be taken out into the North Sound. They do not often get this opportunity, but on days with these conditions - well, no is not accepted for an answer. Mandy adores the stingrays and cannot collect enough photos of them, while Gina adores Starfish Point and no family tour can be completed without stopping at this island attraction. Captain Mario stopped off at a beautiful spot for the snorkelling - a little out of the usual site but along the barrier reef. The propellors had hardly stopped turning before Mandy was in the water, where she was met by a gigantic Mutton Snapper who surprisingly accompanied her for most of her visit - how wonderful! His size is not easy to see from the photo below, but he must have been at least 3 feet long - usually they are rather timid as the locals fish for them, but this guy was quite happy to tag along. The reef was splendid - Mandy felt that there was a certain magic in the water and was amazed to see so many fish and corals - an enormous Queen Angel Fish and a school of one of her favourite fish, the Blue Tang, were some of her pleasures. 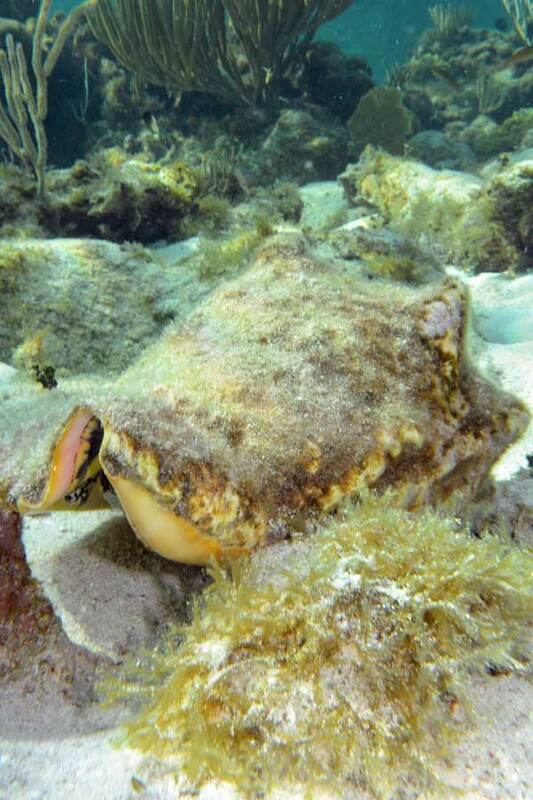 Add to that the fact that she found four live conch and her day was already made! We used to fish for conch for our standard excursions, but changed our policy this year - we feel that they are already over-harvested and hardly see any these days. You can be sure no-one will be told of these conch's whereabouts! After the snorkelling, and during our boat ride to Stingray City Sandbar, we were treated to a beautiful rainbow hitting land on the North Side. Wow, we did not think it could get too much better, but we were wrong. Once again, Mandy was testing Captain Mario's patience with wanting to spring into the ocean before the propellors had stopped twirling ...... can you blame her when you see the conditions were like the photo below? The above image was taken from on-board "Big John" - the waters were so clear you could see right to the sand bar bed with the ripples of sand caused by the flow of the ocean. The first sight was of a ginormous stingray burying herself into the sand - we were delighted to see that she was very, very swollen with pregnancy and can't wait to have her little ones darting around. She eventually stopped "digging" and lumbered over for a kiss and some lovin' .... got a picture of her in Captain Mario's arms, just resting there for a bit.... we made sure to give her plenty of stingray "popcorn" (squid) to keep her nicely fed for her babies! The "girls" felt the magic of the day and cavorted with us and the other sandbar visitors with great abandon and a lot of kisses and hugs and snuggles were shared - oh what a time was had! Mandy and Gina were in 7th heaven! It was tough to leave this spot, but Gina was in nagging mode by now, and Starfish Point was obviously next on the itinerary. On the way over to this heavenly beach on Grand Cayman, we were given a hint of what to expect, with the skies and clouds forming incredible shades of blue and greys. Gina was extremely verbal in her delightful find of 4 starfish with excited yelps and squeals heard by all. But those quietened down when the sunset put on an astounding show. When even a four year old is heard to say "lets sit quietly and watch the sunset" you know it has got to be a good one! Below is the proof .... what a magical day to enjoy and witness. On days such as these, one can only be hugely grateful to be living surrounded by peace, surrounded by beauty and surrounded by hope - hugely lacking in so many parts of the world. Thank you. 24 January 2015 - Caribbean Paradise day!